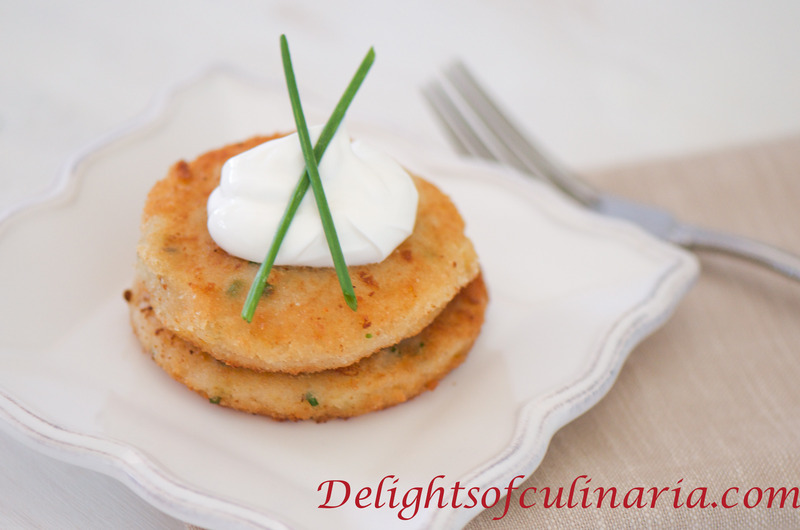 These potato pancakes are delicious! And with just few ingredients it’s really simple and easy to make.This recipe is perfect to use left over mashed potatoes or you can cook up fresh mashed potatoes.I like to make them with fresh chives and cheddar cheese, coated with breadcrumbs for crispiness,pan fried and served with a dollop of sour cream. Combine egg,flour,chives,and cheese with mashed potatoes. Shape the potato mixture in to patties. Dredge patties in breadcrumbs or flour. Add oil about 2-3 tablespoons. Fry potato pancakes on both sides for about 3-4 minute or until well browned and crispy. Fry in batches and add more oil as needed. Enjoy with dollop of sour cream. Это верное решение, когда остается картошка пюре!!! Спасибо за идею!